Republican Sen. Jeff Flake of Arizona, who frequently publicly disagrees with President Donald Trump, said anyone in his party who is a critic of the president is unlikely to do well in Republican primaries this election season. “There is no room for Trump skeptics, let alone Trump critics, in Republican primaries these days,” Flake said on "The View" on Tuesday. Flake, who is not seeking re-election, was on “The View” to celebrate the birthday of fellow Arizonan, co-host Meghan McCain. He reflected on the heated partisanship in the country, with him and McCain sharing that they had spoken about his recollection of being at a congressional softball game in 2017 where GOP Rep. Steve Scalise was shot. Flake said that as he "watched the bullets pitch off the gravel," he thought to himself, "Why us?" He said he was in disbelief that a shooter would target "a group of middle-aged men playing baseball," and he decried the level of vitriol between the two parties. 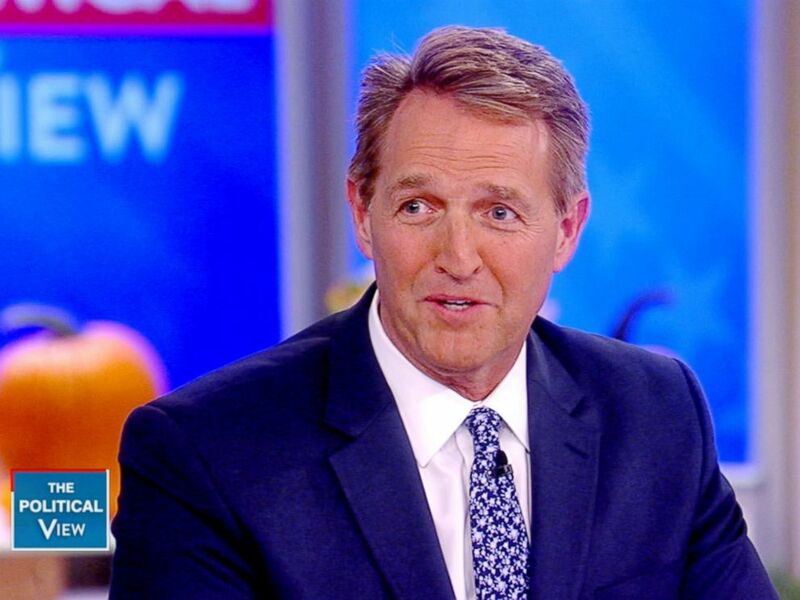 Senator Jeff Flake appears on "The View," Oct. 23, 2018. "It's out of control right now," Flake said. As for speculation that he might run for president in 2020, Flake joked that he has made visits to a very important primary state. “I’ve been to New Hampshire a couple of times, but just for the weather,” he said. The Arizona senator was also asked about his vote in favor of confirming now-Justice Brett Kavanaugh to the Supreme Court. Flake said he believed the stories and concerns of protesters against Kavanaugh who accosted him on Capitol Hill prior to the vote. “I would have liked a broader investigation that started sooner,” he said of the FBI investigation into allegations of sexual misconduct against the Supreme Court nominee, which Kavanaugh categorically denied. But, he said of his vote in support of Kavanaugh, a “mere allegation with no corroboration” is not a reason to vote against a nominee. “I wish I had the certitude that some of my colleagues expressed,” Flake said about the vote. Flake also talked about his long friendship with the late Sen. John McCain, saying that his former colleague was extremely proud of his daughter. “If John McCain could have put ‘The View’ on in the Senate cloakroom every day he would have,” Flake said.